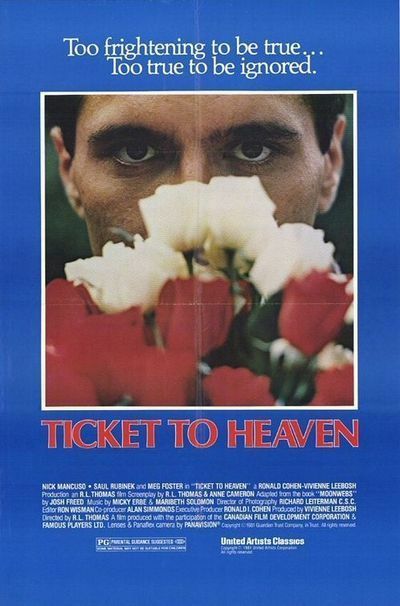 “Ticket To Heaven” is about a young man who enters the all-encompassing world of a religious cult. What makes the movie absolutely spellbinding is that it shows us not only how he is recruited into the group, but how anyone could be indoctrinated into one of the many cults in America today. This is a movie that has done its research, and it is made with such artistry that we share the experience of the young man. His name is David. He is played by Nick Mancuso, a powerful young actor, as an independent type who flies from Toronto to San Francisco to discover what has happened to a friend who joined up with the cult. He is welcomed to their communal residence, joins in a meal and some singing, and is asked if he'd like to spend the weekend at a retreat on the group's farm. He would. By the end of the weekend, he is a cult member. Can it happen that fast? I've read stories claiming that some cults need only seventy-two hours to convert almost anyone to their way. The best and the brightest make the best recruits, they say. The movie shows the three techniques used to indoctrinate new members: (1) low-calorie, low-protein diets; (2) sleep deprivation; (3) "love-bombing," which involves constant positive reinforcement, the chanting of slogans and great care never to allow the recruit to be alone for a moment. Although “Ticket To Heaven” does not mention any existing cult by name, it is based on a series of newspaper articles about a former Moonie. The techniques in the film could, I suppose, be used by anybody. What makes the film so interesting is that it's not just a docudrama, not just a sensationalist expose, but a fully realized drama that involves us on the human level as well as with its documentary material. There are scenes that are absolutely harrowing: an overhead shot of David trying to take a walk by himself and being "joined" by jolly friends; a scene where he guiltily bolts down a forbidden hamburger; a scene where another cult member whispers one sentence that sounds to us, as much as to David, like shocking heresy. By that point in the film, we actually understand why David has become so zombie-like and unquestioning. We have shared his experience. The final scenes in the film involve a deprogramming attempt. They are not as absorbing as what went before, if only because they involve an effort of the intellect, instead of an assault on the very personality itself. I've seen “Ticket To Heaven” three times, and at first I thought the film's ending was "weaker" than the rest. Now I wonder. What cults offer is freedom from the personality. They remove from your shoulders the burden of being you. That is a very seductive offer: why else do people also seek freedom from self through drugs, alcohol, and even jogging? As David is seduced into the cult's womb, we also submit vicariously to the experience. We understand its appeal. At the end, as David's reason is appealed to, as his intellect is reawakened, as he is asked to once again take up the burden of being himself, he resists--and maybe we do, too.